The Lilywhites number has enjoyed balancing international duty with club games. Rogers chats to Roy Keane in Abbottstown. THE FIXTURES ARE coming thick and fast for Dundalk due to their exploits in Europe this season. Tonight’s SSE Airtricity League Premier Division game with Bohemians will be the Lilywhites’ fourth in ten days, and they’re back in league action on Tuesday with a trip to the Showgrounds to take on Sligo Rovers. And it’s a particularly busy period for Gary Rogers as he was called up to the Ireland squad as third choice goalkeeper for their World Cup qualifier with Serbia. The 34-year-old was present at today’s training session in Dublin but sat it out as he is set to mind nets for his club at Dalymount Park. “I’m hooking up with Dundalk tonight against Bohemians, then after the game I’ll be heading to the Ireland team hotel to fly to Serbia on Saturday,” Rogers told the media today. Rogers is unlikely to earn his first senior cap in Belgrade on Monday, but the Meath man sees the experience as a great opportunity and praised Martin O’Neill’s group of players. Having won the league/cup double with Dundalk, defeated BATE Borisov in the Champions League qualifiers, secured a place in the Europa League group stages and received international recognition, Rogers is thankful of how the past 12 months have panned out. Email “From Serbia to Sligo: Gary Rogers' hectic few days due to Ireland and Dundalk commitments”. 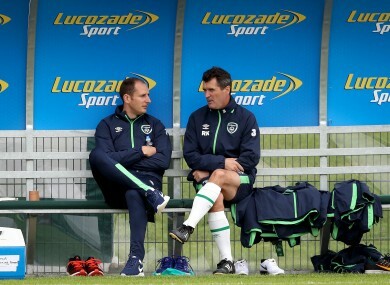 Feedback on “From Serbia to Sligo: Gary Rogers' hectic few days due to Ireland and Dundalk commitments”.